Hey, hey, my, my. Is this the story of Franz Ferdinand? 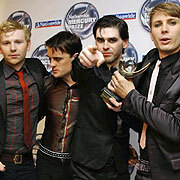 Franz Ferdinand has won the British Mercury Prize, the U.K.'s most prestigious prize for new music. But what does this mean for the future of music asks John Harris in The Guardian? "Roll over Sid, and tell Joe Strummer the news: whereas the kind of British musicians who attracted words like 'alternative' were once duty-bound to affect a mixture of rage, debauchery and indolence, their modern heirs are a terrifyingly well-adjusted bunch. Tuesday evening provided conclusive evidence: when Alex Kapranos, singer with the allegedly iconoclastic Franz Ferdinand and fan of the word 'fantastic', accepted the Nationwide Mercury Prize, his speech proved that the last embers of punk attitude have been long since snuffed out. " Can Franz Ferdinand really mean the death of punk? Well, I think not -- certainly not at the hand of FF. Punk may have died with grunge - or just reinvented itself. So what would Johnny Rotten have thought? More on grunge, alternative and punk music.